Email marketing is more powerful than it’s ever been. 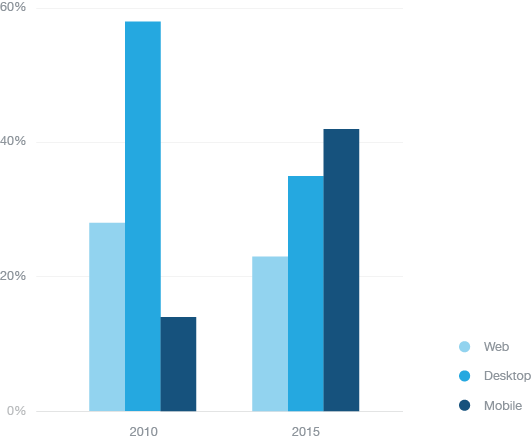 The past decade was the most exciting decade for marketers…and it’s getting better. An explosion of new digital technologies pushed us to evolve. But those same technologies can leave a marketers’ head spinning. What’s the right marketing mix? How much should you invest in new channels? Which channel is most effective for acquiring new customers and driving revenue for your business? Even with the explosion of new technology, marketers keep coming back to email. The reason is clear–for ten years in a row, email is the channel generating the highest ROI for marketers. 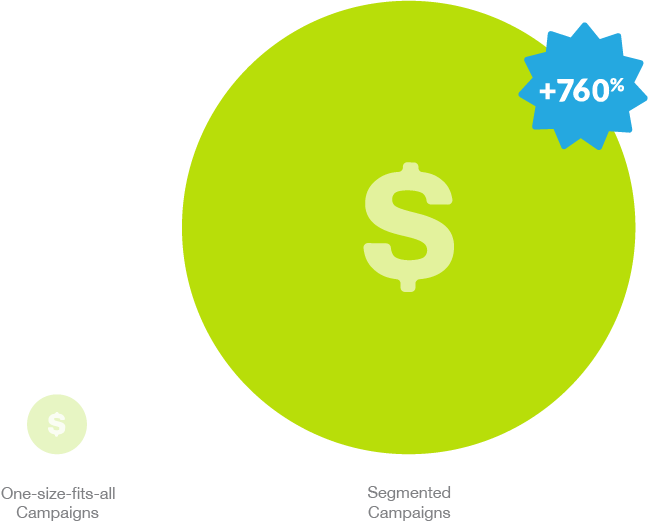 For every $1 spent, email marketing generates $38 in ROI . When you want to grow your business, acquire new customers, launch a new product, offer a promotion, you turn to email. Why? Because email delivers better than any other channel. 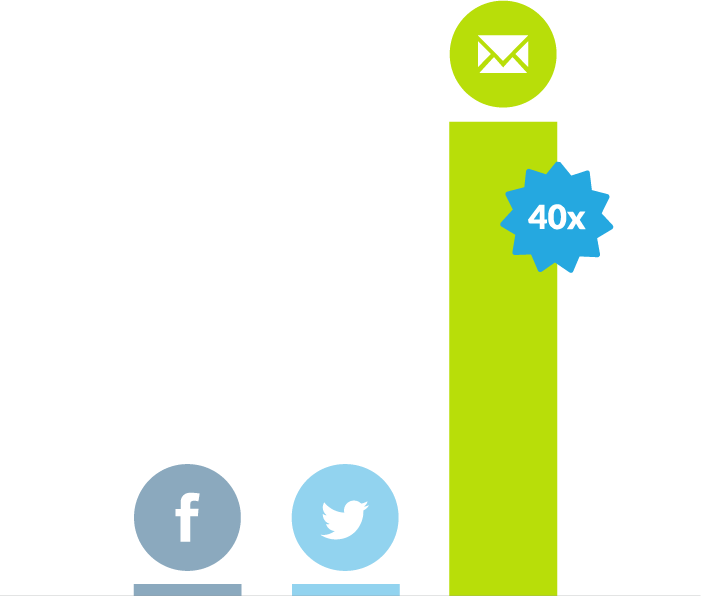 Email is 40 times more effective at acquiring new customers than Facebook or Twitter 2. But email marketing today is far different than 10 years ago. Technology has forever changed the way customers interact with businesses. Marketers looking to engage customers, differentiate their brand, and grow their businesses need to live and breathe these five new rules of email marketing. First technology makes things possible. Then it makes things easy. We’ve hit that point in the marketing technology continuum. Sophisticated technology processes that were once left to the IT professionals are now a reality for every marketer–in any size business, industry, or region. Welcome to the era of the DIY (Do It Yourself) Marketer. Companies like Optimizely for A/B testing, Squarespace for website creation, Unbounce for landing page generation, and Shopify for easy e-commerce are leading the DIY revolution. Business critical activities that used to take weeks (or even months) and an entire IT staff to accomplish can now be done in minutes by a DIY marketer. And email is no different. Gone are the days of waiting for weeks in “the email queue” while developers code your emails. You can and should own your email destiny. As brand ambassadors of the business, marketers need to make sure email is on brand, on message, and pixel perfect. With the myriad of DIY tools at your disposal, you can now ensure every customer touchpoint is both engaging and brand appropriate. Modern email service providers give marketers intuitive, easy-to-use tools to create beautiful emails without any development hassle. Whether you’re sending a newsletter, announcement, or promotion, your emails need to be on brand, but who has the time to perfect the layouts and design? When you use pre-designed templates you ensure every email looks professional, and you don’t have to code! For marketers who want to customize their email templates, DIY email tools make it easy with drag-and-drop technology, editable layouts, and the ability to specify brand colors and fonts. It’s a fast-paced, multi-device, multi-screen, mobile world. 60% of online adults in the US and UK use at least two devices each day 3. Mobile is at the epicenter of today’s digital experiences. From 2010 to 2015, email opens on mobile devices increased by 30% 4. 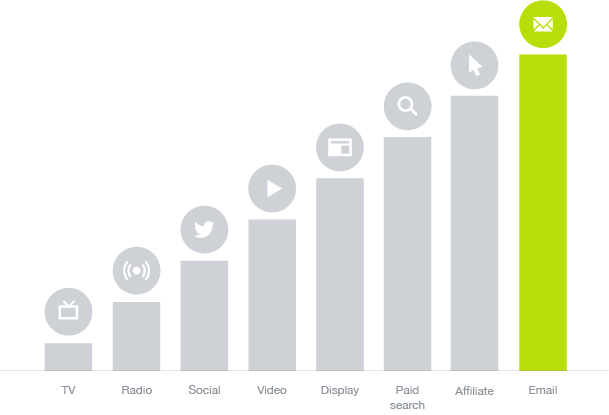 But this is just part of the bigger story, in which online audiences are constantly moving between devices. 40% of online adults will sometimes begin an activity on one device and finish on another. In the past, we worried about how our emails would look on several email clients. But the explosion of devices and email clients has created an insane challenge for marketers. Do you know what percent of your subscribers will open your email on a mobile phone versus tablet versus desktop? What percent will open your email on an Android versus iOS? What percent will open in Gmail? Yahoo? Hotmail? AOL? Or even Outlook 2003? What about Apple mail? The Gmail app? Or even the new Gmail Inbox? It’s impossible to ensure your emails look good on every desktop client, web client and device. There just aren’t enough hours in the day to design, code and test for all those experiences. Email with mobile-ready design is no longer a nice to have, it’s a must have. You need a modern email service provider that takes the hard work out of email design so you can focus on perfecting your message and optimizing your campaign. Modern email software provides you peace of mind, knowing your emails will look awesome on every screen. There’s no telling where your subscriber will be when they open your emails, but there’s a good chance it will be on a mobile device. 53% of emails are opened on mobile devices. You need templates that will be automatically optimized for both desktop and mobile email clients. This means you know it will look just as great on an iPhone as it does in Outlook or Gmail or the hundreds of other devices and clients your subscribers are using. If your emails aren’t relevant to your subscribers, they’ll end up in the trash. The marketing world is buzzing about the ‘Internet of Things (IoT)’, but we should be talking about the ‘Internet of Me.’ In the age of personalization and hyper-targeting, consumers expect brands to know who they are and provide them content they care about. You have to deliver the right message, to the right person, at the right time. Today’s consumers are bombarded with information, and marketers are constantly looking for ways to cut through the noise and reach audiences. Relevancy is the marketer’s secret weapon, and the fastest path to revenue. Emails with personalized subject lines are 26% more likely to be opened and marketers have found a 760% increase in email revenue from segmented campaigns. Email marketers need an efficient way to group customers by demographic information, purchase history, and browsing activity. From this information, it’s possible to tailor email messaging to specific groups. As cohorts grow larger, you can make your segments more granular. 74% of online consumers get frustrated with websites when content (e.g. offers, ads, and promotions) appear to have nothing to do with their interests 5. Marketing content needs to adapt to individual customers’ precise interests. You can’t just send email blasts with one-size-fits-all messages. That’s why 75% of enterprises will be investing in personalized messaging in 2015 6. As businesses grow, it becomes increasingly difficult to give one-to-one attention to each customer. With email automation, marketers can easily create workflows to send personalized, timely, relevant emails to customers at the right time. In the DIY revolution, modern email platforms enable marketers to do this on their own with just a couple clicks. 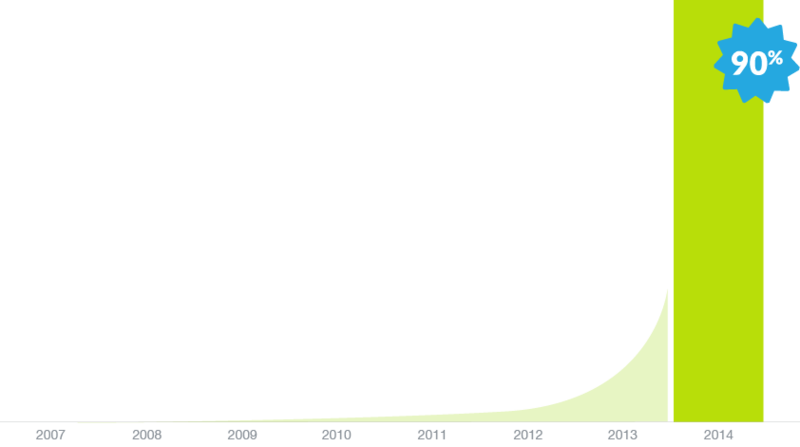 90% of the world’s data was generated in the last 12 months. Sound intimidating? It doesn’t have to be. It’s an opportunity to truly know your customers and drive your business goals. That’s why 94% of marketers are investing in data and analytics capabilities to identify customer information for targeted insights, and 94% of marketers are building management capabilities to collect, store, manage, and analyze customer profile data. In the past when you wanted to know how your campaign performed you usually turned to someone on your operations team to run a report, which could take days or weeks. And then the results generally showed just email opens and clicks. But today’s marketer has much more real-time data at their fingertips. It’s how you use that data to learn, adjust and optimize your campaigns that will set you apart from your competition. The modern email marketer is a kaizen marketer, focused on continuous improvement. They’re constantly trying new ways to reach subscribers, testing subject lines, adjusting buttons sizes, adapting messages and tactics to optimize campaign effectiveness and make each campaign better than the last. Every audience is different. You must test to know what works. A/B tests can improve conversion rates by 49%. Modern email software makes it easy to A/B test your email campaign, makes adjustments on the fly and continuously improve your campaign performance. Understanding which aspects of your email campaign drive engagement and influence purchase decisions is critical. You need tools that shed insight into what your subscribers care about, what CTAs and links are driving engagement so you can improve campaign performance over the long and short term. Email marketers need to be able to deliver concrete ROI in the form of leads, monetization, and revenue—often, with shrinking budgets. With insight into what subscribers care about, marketers are better positioned to drive conversions. Customers expect a consistent experience no matter how, when or where they interact with your business. But here’s a little secret: your business is sending emails you don’t know about…and chances are, you’re missing huge opportunities. What’s even worse is that these emails have the highest open rates of any emails you send. What are these magic emails? And how do you get our hands on them? Transactional emails are automated messages sent to individuals triggered by some sort of action or inaction. Think purchase receipts, confirmations, shipping notifications and password resets. 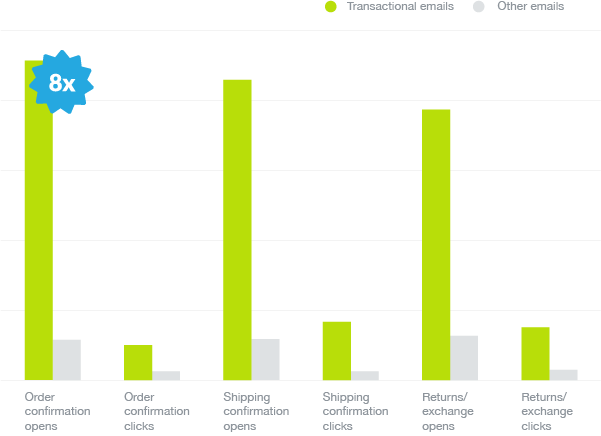 Open rates for transactional emails are four to eight times higher than traditional emails because customers are usually asking for the information contained in them. Talk about relevancy and timing. Traditionally these emails are coded by developers and are stuck in your source code. But marketers who want every customer email to be on brand, personal and engaging are looking at transactional emails as an opportunity to build brand loyalty and drive revenue. You already do that through newsletters, announcements, promotional emails. Now you can add transactional emails to the list. Turn emails with crazy high open rates into beautiful customer communications and new opportunities to engage customers and drive revenue. In the new era of the DIY Marketer, the savvy marketer can and should use easy and effective tools to capitalize on the specific interests of millions of customers, reaching them with compelling, relevant emails that will drive better business results. 1. Find the report from VentureBeat here. 3. Find Facebook’s report from 2014. 4. We have some stats regarding that here. 5. Janrain has published a study here. 6. Here’s the VentureBeat report that talks about it. Join 150,000 companies around the world that use Campaign Monitor to run email marketing campaigns that deliver results for their business.